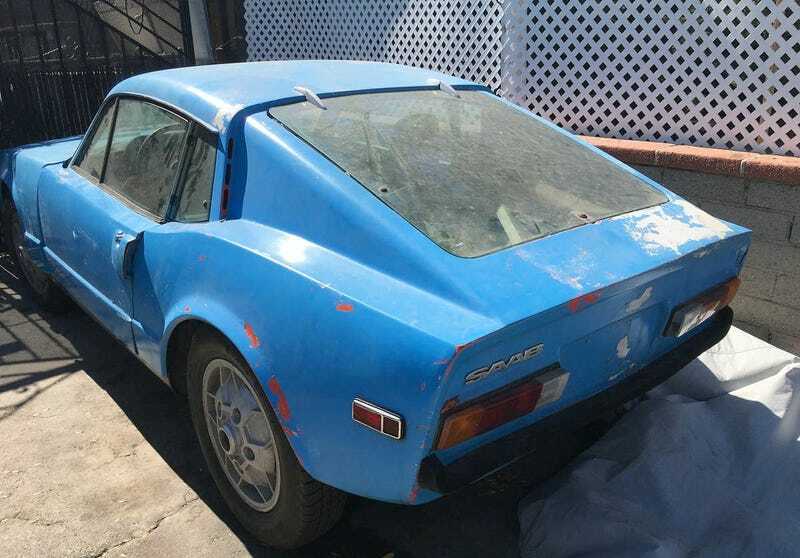 For $2,400, Could This Duo Of 1974 Saab Sonetts Be 'Two' Much Trouble? Doubling down is a risky move in blackjack, but one that could result in twice the payout. That same strategy might be applied to today’s Nice Price or Crack Pipe brace of Saabs. We’ll have to see if their combo price stacks the deck against them. Nissan once was called Datsun in America and under that brand they sold some really good looking cars as well as some really desperately ugly cars. For whatever reason they decided to give the Datsun brand the old heave-ho, and in the ‘80s, started calling even their U.S. bound cars Nissans. Under those later auspices they built some really fine looking cars. That is, until something with the name Murano came out. No one’s quite sure what happened then, but with few exceptions, Nissans haven’t been the same ever since. One of the nicer looking cars Nissan has offered us—maybe even the nicest—was the S13 sporty coupe. We had one yesterday, a 1990 Nissan 240SX, and it holds up well esthetically even today. It also presented as nearly stock, an amazing feat for a car that’s numero uno on the Yo Boi! drifter crowd modder list. Unfortunately the car did need one modification, that being to its $8,995 price tag. That was at least the view of 62-percent of you who dunned the car with a Crack Pipe loss. Some even averred in the comments that the price was almost twice as high as reasonable. Twice as high? Hmm, what if there had also been twice as many of them? We can’t contemplate that now because we have to move on to today’s candidate, which is two Saab Sonett IIIs. Now, when you think of Saabs and sports cars you may have visions of rally cars—perhaps upside down with Erik Carlsson hanging from his five points—but not generally about pointy prowed two-seaters. Well, that is unless you’re well versed in the form of automotive poetry known as the Sonett. Built from 1966 to ’74, the Sonett II, V4, and III models competed with Triumph’s Spitfire, the MG Midget, and a spate of new econoboxes for entry-level driver dollars. The big differences with the Swedes was the use of a unique V4 engine that they sourced from Ford, and too course, FWD. The final Sonett model, the III was the most well thought out of the series, however it still embodied a certain level of kit car-ness about it. Still, the III’s bodywork proved handsome, its headlights popped up, and practically no one could tell that the model’s entire center section heralded back to the original Sonett II of 1966. And here we have two of them! The ad claims the two blue cars are ‘74s, but the bumpers indicate otherwise. Most likely these are ’70 or ’71 models owing to their skinny blades. It doesn’t really matter as the only major differences between the early and later series III cars are those bumpers and a bump in displacement from 1500-ccs to 1700 for the V4. Whichever year these two cars turn out to be, they apparently come with clear titles. They also, quite amazingly, both run. 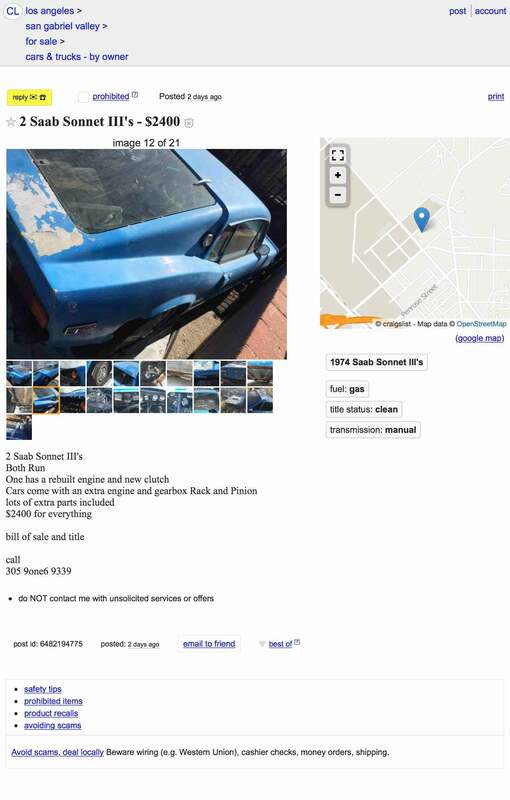 In fact, the seller says that one comes with a rebuilt engine and a new clutch. The rest? Well, let’s just say there’s plenty to keep you busy here. Neither car appears ready to hit the street, however both seem relatively complete and there’s the promise of extra parts that join the cars in the deal. Both cars run factory five lug soccer ball wheels, and both are blue making it a little difficult to know which one you’re looking at in the ad’s pictures. Also, I’d like to note that its’ been DECADES since I’ve seen Union 76-branded tires on a car. Those things must be hard as Texas hail. There’s a lot of surface bodywork needed on the fiberglass bodies of both cars too, but you could easily use the sunroof car for practice and then totally Ed China the nicer, closed can car. The steel frames on each will need some tacking and replacing, but then again you’ve got two cars so if you screw up one you’ll still have a spare. The package comes with a bill of sale and title, but obviously these cars are not currently registered for the road. That’s not a big deal here in California as the Highway Patrol is happy to send an officer out to your house to certify an old VIN allowing it to be re-entered into the DMV’s system. Of course before that can happen, there are some questions that might, or might not, need to be answered. Mileage? Who cares? The fact that you’d likely need to make two trips to bring them both home? Meh, the fresh air will do you good. Can you get tetanus from fiberglass? Maybe! Look, this is a project, albeit one of small dimensions and with a backup plan built in too. Could that all possibly be worth a mere $2,400? Or are these two cars just too far gone for even that much? H/T to BaT for the hookup! At $8,995, Would You Make This 1990 Nissan 240SX Your Homie?